Are you excited to go back to the big pretty planet known as Pandora, populated by large blue cat people? ARE YOU? Whether you are or not, you better start getting prepared, because Zoe Saldana has pretty much confirmed that the two Avatar sequels (entitled, thus far, Avatar 2 and Avatar 3) are going to start shooting in 2014. Speaking on The Jonathan Ross Show during her junket for Star Trek Into Darkness, Saldana confirmed that two Avatar sequels will also likely shoot consecutively. She thinks that if they film Avatar 2 and wait, she’ll probably be pushing fifty by the time they get to Avatar 3. As interesting as that might be, it’s unlikely to sustain audience interest. The films therefore follow in the brilliant footsteps of The Lord of the Rings, and the slightly less brilliant footsteps of The Matrix trilogy. 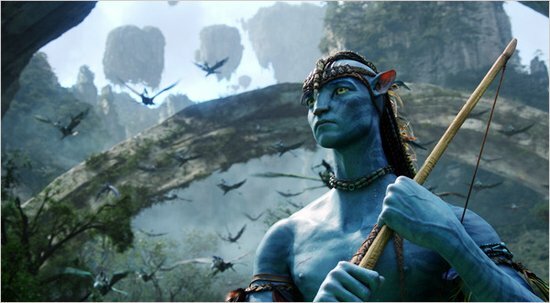 Avatar 2 was originally targeted for December 2014, but this news from Saldana puts that into the ‘unlikely’ pile. If both films shoot in 2014, then we’re looking at a more reasonable 2015 release date for the first, given how long it takes to put everything together. The second would probably hit more like 2016, unless of course they pull a Hobbit and try to get them out fairly close to each other. The good news, though, is that that means we won’t get another James Cameron film for a really long time. Avatar was a really impressive film that unfortunately kind of loses power on repeated and non-3D viewings. I do not know what else Cameron hopes to do on the planet of Pandora, but it’s quite an attractive world with attractive creatures on it, so there’s a lot that can be done. I only hope that Cameron focuses on the story and not on the bright and shiny objects. That’s the current update on the Avatar sequels. We’re heading back to Pandora, but not for awhile yet. You’ll just have to get your gigantic smurfs fix elsewhere.